Again in 2014, hundreds of runners participated in the NOLA Trail Run Series, presented by Premiere Fitness. Each weekend in the month of June, different trails around the city of New Orleans hosted a race for athletes to "get off the pavement" and experience the unique feeling of running on mud and grass in our very urban environment. This week, New Orleans Running Systems, the organization that executed the races, announced overall and divisional winners from the trail run series. Completing each race in the series, the overall winners were Josh Chauvin and Marie Claire Lamb. Youth division winners were Dominic Michalik and Lillian Fontenot. Topping the 18-29 year old division was Joe Henchen. The 30-39 division was led by Randall Howell and Aleesha Kuhn. For the 40-49 age division, Steven Hawkins and Angela Wiedman led the pack. In the 50-59 division, John Andrews and Mary Ellen Pratt won out. The 60-69 group was dominated by Ken Mire, and the 70 and over division was won by Ronald Williams. 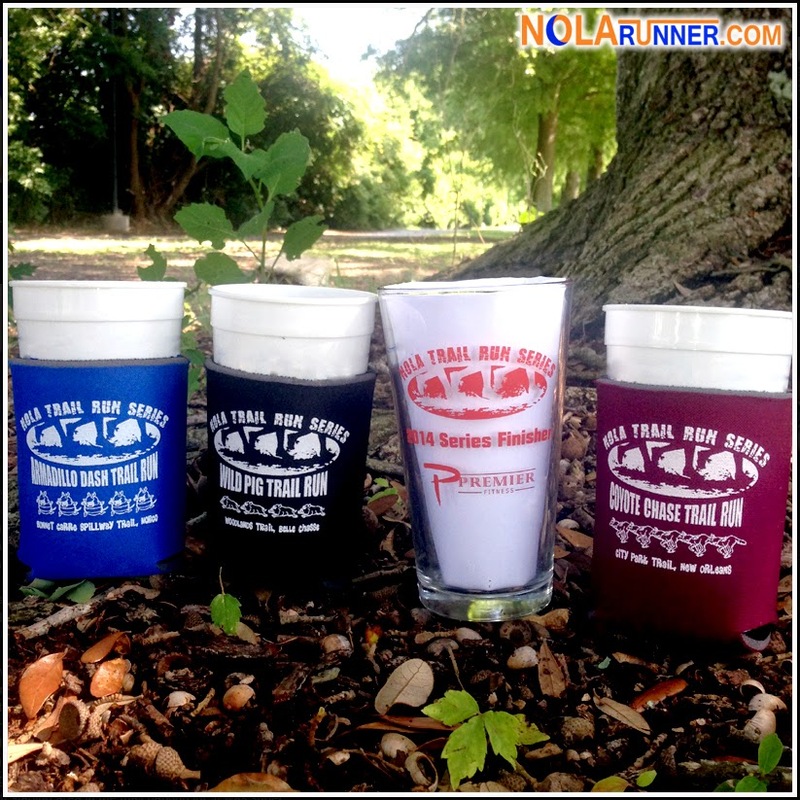 Each of the division winners received a plaque for their accomplishments; however, everyone who finished all three of the NOLA Trail Run Series Races went home with a finisher pint glass. Plus, those who couldn't attend all three still received a commemorative koozie to keep the beverages cold post-race. These awards can be seen in the photo above. For those of you who want to try trail running but were unable to take advantage of this fun series, the New Orleans Track Club is hosting the Spillway Classic Trail Run on Sunday, July 13th. Click HERE for more info. For complete NOLA Trail Run Series results, click HERE.